I am not big into star signs and their attributes. I think I stopped reading horoscopes in my teenage years after I realized it will not tell me if the boy of my dreams was also in love with me. I never got the ones that I was in love with. That's for sure. However, the other day, I had a conversation with someone about star signs. I was told that people of my star sign are good leaders, are good finishers and work well under pressure. That, I think, proved true today. It's weekend, but my husband had work to do at home for the whole day. So I was in charge of entertaining the kids and provide all meals. Cool! No problem! A normal day starts like this: my kids don't greet me in the morning with "Good morning mummy, we love you!" Instead I hear "Where is the Porridge? I am hungryyyyyyy! "- Alright, coming in up in minute. After breakfast I took the kids to the swimming pool, in the hope they would exhaust themselves, and at least my 2-year old daughter would have a lunchtime nap. Nope!! After the swimming pool I built train tracks for an hour, during which I was allowed to have breakfast myself. Thanks. Close to lunchtime I decided to make lunch and dinner at the same time. I thought it would be really cool if I could come up with something nice without having to go the shops. For lunch I was Mexican-inspired when making homemade flat breads filled with chicken, guacamole, sour cream, etc. At the same time I was preparing this quiche for dinner. It has become one of our staples on weekends. 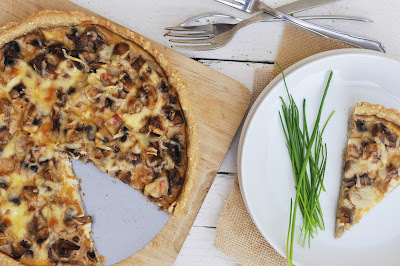 I love my savory tarts, and the mushroom bacon combo is by far the most popular filling. I finally managed to take some decent pictures of it (which made this post possible today), before taking the kids to an indoor play and climbing area in the afternoon. Coming back, I just jumped into my running clothes to go to my running group which has a weekly race over either 3.4km or 6.8km. I only rejoined them a few weeks ago, and I am still improving my seasonal best time every week. Another 15 seconds off from last week's seasonal best. Yeah, just what I needed!!! Spread the oats and sesame seeds on a baking sheet and toast in the oven for 8 minutes. Transfer the toasted oats and sesame seeds to a bowl of a food processor fitted with a metal blade. Add the flour, baking powder, salt, and pepper, and process until the oats are finely ground. Roll out the dough on a lightly floured surface. Put the dough in the tart pan. Press it down evenly, making sure to fill in the fluted sides of the pan. Trim the tart of any excess dough. Prick the base and sides of the crust all over with a fork to prevent bubbles. Pre-bake for about 10 minutes. Set aside. Heat a pan over medium heat and add the bacon. Stir occasionally. Once it releases the fat, add crushed garlic. Stir occasionally. Cook until bacon starts to become crisp. Add the sliced mushrooms. Season with 1/2 teaspoon of salt. Cook for about 3 minutes. The mushrooms should retain a little bite. Take off the heat and set aside. Whisk together the eggs with the milk. Season with salt, pepper and a pinch of nutmeg. Pour the bacon mushroom mixture into the tart shell. Pour over the egg milk mixture. Sprinkle grated cheese onto the top and bake for 25 minutes, until egg mixture has set. Let stand for another 10 minutes before slicing and serving.